The recent rise to prominence of renewable energy and energy efficiency has been driven by their potential to lower the environmental impacts of energy use. As these technologies mature they must demonstrate not only their environmental benefits, but also their economic competitiveness. The relative costs and benefits of each potential project, whether large or small, must be systematically modelled and assessed before they can be financed and implemented. Renewable Energy and Energy Efficiency: Assessment of Projects and Policies deals with the appraisal of such projects against financial and non-financial criteria, illustrating the assessment tools necessary to make appropriate, evidence based decisions as efficiently as possible. The most important technologies are first described, stressing their economic and performance characteristics. Key project appraisal concepts are then introduced, approaches to modelling the cash flows in energy projects are described, and the issues of uncertainty and optimisation are fully discussed. These financial concepts, together with methods for estimating greenhouse gas emissions, are extended to address aspects of energy policy. 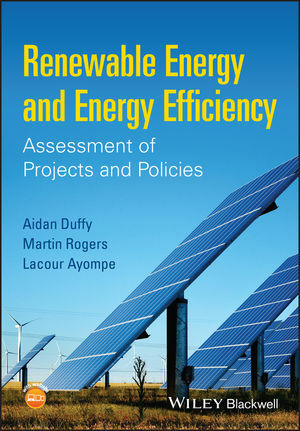 Illustrated with many case studies this is an ideal introduction to financial and non-financial appraisal techniques as applied to energy efficient and renewable energy technologies. Professor Aidan Duffy BA, BAI, MBA, PhD, CEng, is a lecturer at the Dublin Institute of Technology where he specialises in the financial, economic and policy assessment of renewable energy technologies and energy efficient systems. Dr. Martin Rogers BE, MEngSc, PhD, BA(Public Ad), CEng, MICE, MRTPI, Chartered Engineer and Chartered Town Planner is currently Assistant Head of School and Senior Lecturer in the School of Civil and Building Services Engineering at Dublin Institute of Technology. Dr. Lacour Mody Ayompe BEng, MEng, MSc, PhD, CMVP, MAEE, MIEI, is a Researcher at the International Energy Research Centre, with research interests in the energy, financial, economic, and policy assessment of renewable energy technologies and energy efficient systems.